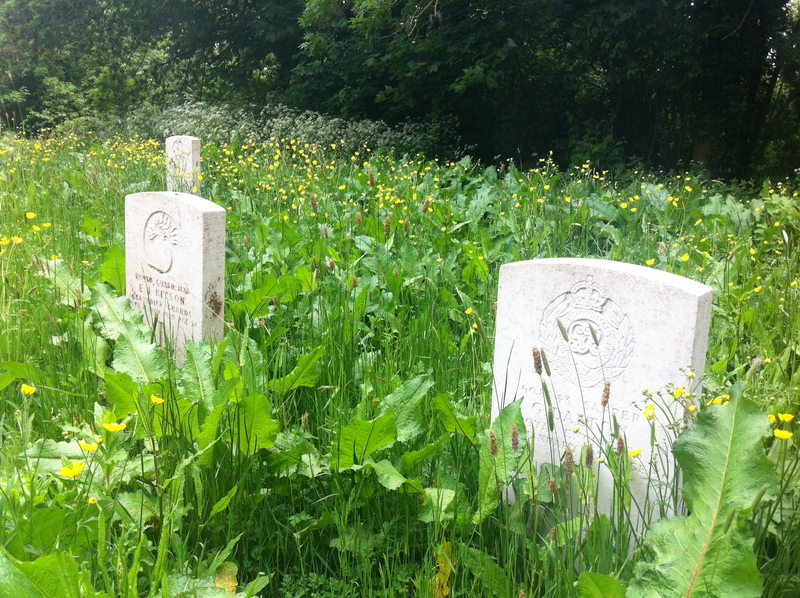 A couple of examples of overgrown CWGC headstones in Hampstead Cemetery, London. The two in the foreground commemorate Sapper George Dalton of the Royal Engineers and Guardsman Ernest Kitson of the Grenadier Guards. According to CWGC, Sapper Dalton was 46 and belonged to 1st Base Park Company, RE. Guardsman Kitson was 26 and was the husband of Alice Kitson, of 62 Gordon Rd, Lower Edmonton, London. Compared to the beautifully kept cemeteries of France and Belgium, this corner of Hampstead cemetery is pretty neglected unfortunately. This entry was posted in Soldiers of the Great War and tagged Edmonton, Grenadier Guards, Hampstead, Royal Engineers. Bookmark the permalink. I may pop in with some sheers….